Heldal-Lund is a member of The Heathens, a group of atheists who, through public demonstrations and the distribution of publications, are deeply committed to spreading public antagonism toward religion. The Heathens’ website, on which Heldal-Lund has acted as webmaster, contains these cartoons meant to denigrate and ridicule religious people and their beliefs. Heldal-Lund first appeared on the anti-religious hate scene in 1994 when he suddenly turned up at the Heathen Society’s door, volunteered to start the local chapter in Rogaland, and at once began attacks against Christianity. This intense flurry of activity included writing articles for the Heathen Society’s magazine, “Between Us Heathens,” that are clearly anti-religious in nature and target the Christian Church. In March 1996, Heldal-Lund and a leader of the Heathen Society conducted a campaign aimed at denying Christians the right to the practice of baptizing newborns. 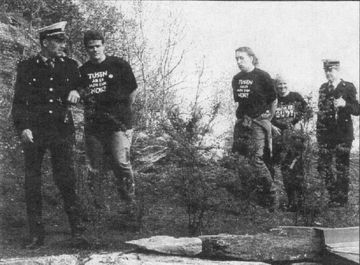 In June 1995 Heldal-Lund was arrested for conducting a hate march at the anniversary celebration of the Lutheran Church.